Jussi Kilpeläinen has created a core memory shield, similar in some ways to ours, but using a CPLD instead of discrete logic for the decoding. He also adds one feature which was missing from our design — a blinkenlight. 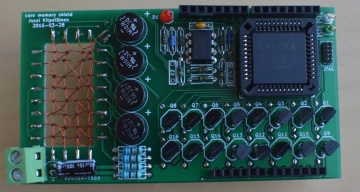 He's made the design available in kit form on Tindie and posted a write-up on his blog with full documentation. We have received a couple of enquiries about a kit, but we didn't have the time to put one together, so it's great that this is now available.